Emergency and exit lighting are crucial components of any evacuation plan and a necessary link to safe escape when a fire or other hazard occurs at your workplace. At State Systems Inc., we take your safety seriously and urge customers to have our certified technicians professionally install and also perform regular inspection of both their emergency lighting and exit lighting. We have the experience and knowledge to ensure your emergency and exit lighting system works properly when you need it most. State Systems Inc. provides emergency lighting installation and inspection services for businesses throughout the Mid-South. To schedule service or receive a FREE quote for your exit and emergency lighting service, call us now at 866-308-5701 or contact us online today! “The only company I trust to do our fire suppression installations is State Systems. I found every employee to be extremely professional and knowledgeable in their work. The one thing that truly stands out is the on-time and accurate communications I receive from them.” – Curtis J. Emergency lighting should be a component of your fire protection plan to save lives in the event of an emergency in your office building. During serious power outage situations, emergency lighting illuminates all exit passages—including corridors, stairwells, ramps, and escalators. Exit lighting also helps by pointing the way to a safe exit. If your property needs emergency or exit lighting installed or replaced, contact us today for a FREE estimate! 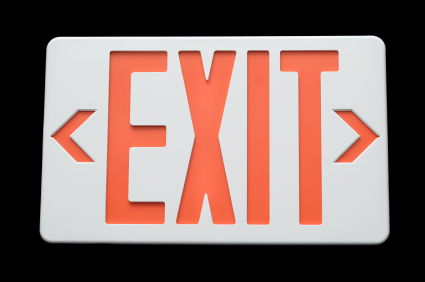 We will also help with exit sign height, location, and placement requirements, ensuring that your building remains safe and up to state code. Whether you’re located in Tennessee, Arkansas, or Mississippi, our fire protection technicians can design a lighting system that will allow for a safe exit for your employees in case of an emergency situation. Call 866-308-5701! In an emergency situation, your employees can become disoriented and overall safety can be compromised if either the emergency or exit lighting fails to activate. Don’t take the components of your emergency and exit lighting system for granted. Let State Systems Inc. check your batteries, charging systems, and bulbs to ensure you’re prepared. To help you out, we keep up with all maintenance and records of inspections so you don’t have to. The National Fire Protection Association (NFPA) 101 Life Safety Code requires that all industrial emergency lighting and exit lighting devices be inspected monthly and tested annually. Additionally, your industrial emergency lighting needs to be up to code regarding the placement, height, and location of the exit signs and lighting. All of our licensed technicians at State Systems Inc. understand the major components and criteria established by NFPA 101, which aims to protect employees in the case of a disaster. Call us at 866-308-5701 to schedule your inspection in Tennessee, Arkansas, or Mississippi today! “Their attention to detail and thoroughness has been unmatched. Projects are 100 times easier with State Systems. We’ve saved a lot of time and money by working with them, which has resulted in a wonderful partnership and a happy end user.” – Matt Miller, Vice President of Air Components, Inc.
State Systems Inc. seeks to embody its mission of protecting life and property into every client and product, every day. With years of proven experience in designing and fitting clients with engineered systems, State Systems Inc. is committed to finding the right solution for you. Whether you need a stand-alone product or a custom-fitted total integration system, you can trust State Systems Inc. to provide top-of-the-line products backed by a highly knowledgeable and dedicated staff. Request your exit and emergency lighting service today! Contact us online, or dial 866-308-5701 to speak with one of our experts. In Tennessee: Arlington, Bartlett, Brentwood, Clarksville, Collierville, Columbia, TN, Cookeville, Dyersburg, Franklin, Gallatin, Germantown, Hendersonville, Jackson, Lakeland, Lebanon, Martin, Memphis, Millington, Murfreesboro, Nashville, Spring Hill, Tipton and Union City. In Mississippi: Hernando, Horn Lake, Batesville, Clarksdale, Cleveland, Columbus, MS Greenville, Greenwood, Grenada, Olive Branch, Oxford, Senatobia, Southaven, Starkville, Tunica, Tupelo, and West Point. To learn more about our emergency and exit lighting inspection services, or for a quote, contact us or call 866-308-5701.